In a world with an increasingly virtual connection between humans, CCTV cameras everywhere, new social networks sprouting all the time and too much information thrown at us, quiet cocoons might be the objects we really need. From zero-waste recyclable nests to golden pop-up homes you can fit in your pocket, we've rounded up six of our favorite green cocoons to share now with you. Click through the images to discover peaceful, cozy and tiny shelters made from innovative eco-materials. Made from an innovative eco-lux material that is recyclable, non-toxic and weatherproof, DEDON’s Nest Rest is the perfect cocoon for snuggling in the wild. Designed by Daniel Puzet and Fred Frety, its production implies zero waste, as every little scrap gets sold or recycled back to make a new product. Made from thick grey felt that is biodegradable, soft and very warm, Freyja Sewell‘s Hush pod was designed for retreating from the world within public spaces. A hiding space, seat and bed all in one, Sewell’s design offers a quiet, dark, soft, and natural place to take a break from the stresses of daily life and other people. 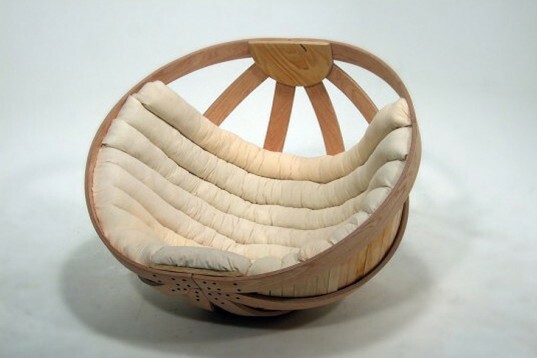 Made from cold-bent plywood and designed by a group of people within the Victoria University of Wellington, cradle is a rocking cocoon for giving autistic people a space to calm-down through movement. Safe, comfortable and flat-pack, the cleverly-designed Cradle is a home within a home. 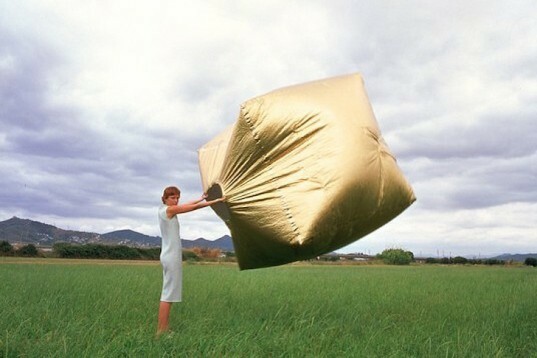 Made from brilliant recyclable polyester and designed by Spanish Martin Azua, Basic House is a self-inflating shelter that fits in your pocket. As soon as the material interacts with body temperature or the heat from the sun, the prefab home takes the shape of a glowing cube for snuggling inside, anywhere you want to take it. Made from plant fibers rattan and designed by Berta Riera Pomes and Yunwei Zhu, Iglu is a cute woven shelter that offers a natural space in which to hide. Eco-friendly, biodegradable and breathable, Iglu is delicately handmade and is sure rock your world. Made entirely from local compostable materials like wood, bark and branches, Cape Town-based Porky Hefer’s Nests are inspired by weaverbirds‘ nests but made for humans. 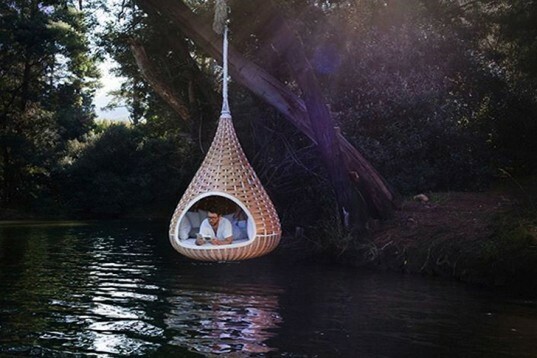 Weather they are hanging from a branch or placed on stilts, Hefer’s natural pods are the perfect cozy cocoons to retreat from the world. Made from an innovative eco-lux material that is recyclable, non-toxic and weatherproof, DEDON's Nest Rest is the perfect cocoon for snuggling in the wild. Designed by Daniel Puzet and Fred Frety, its production implies zero waste as every little scrap piece gets sold or recycled back to make a new product. Made from thick grey felt that is biodegradable, soft and very warm, Freyja Sewell's Hush pod was designed for retreating from the world within public spaces. A hiding space, seat and bed all-in-one, Sewell's design offers a quiet, dark, soft, and natural place to take a break from the stresses of daily life and other people. 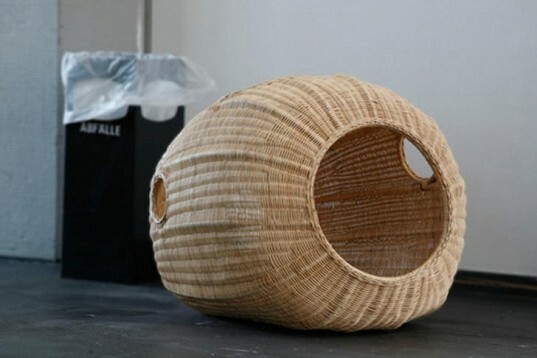 Made from cold-bent plywood and designed by a group of people within the Victoria University of Wellington, cradle is a rocking cocoon for giving autistic people a space to calm-down through movement. Safe, comfortable and also flat pack, neatly designed Cradle is a home within a home. Made from plant fibers rattan and designed by Berta Riera Pomes and Yunwei Zhu, Iglu is a cute woven shelter that offers a natural space to hide. Eco-friendly, biodegradable and breathable, Iglu is delicately hand-made and will sure rock your world. 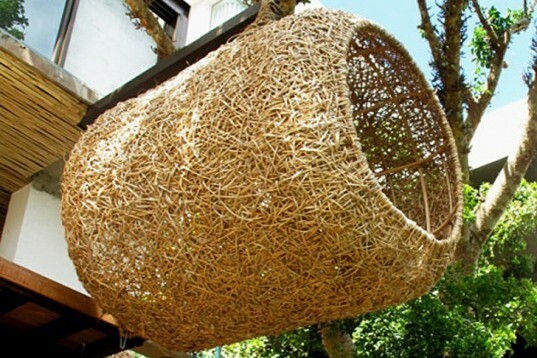 Made entirely from local compostable materials like wood, bark and branches, Cape Town-based Porky Hefer's Nests are inspired by weaverbirds' nests but made for humans. 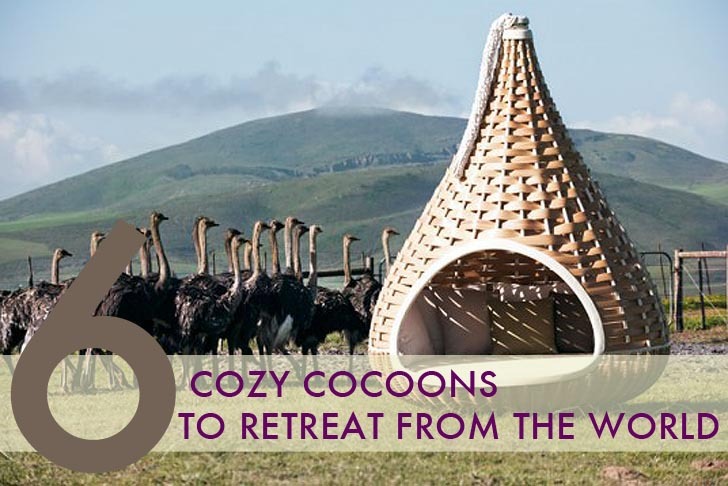 Weather they are hanging from a branch or placed on stilts, Hefer's natural pods are the perfect cozy cocoons to retreat from the world.